PDQ Tampa Bay Area Locations and Metropolitan Ministries, an organization that helps families in need in the Tampa Bay Area, are teaming up once again this year to collect toys for children on the nice list this holiday season. Starting this November, a donation box will be displayed in each participating PDQ restaurant. 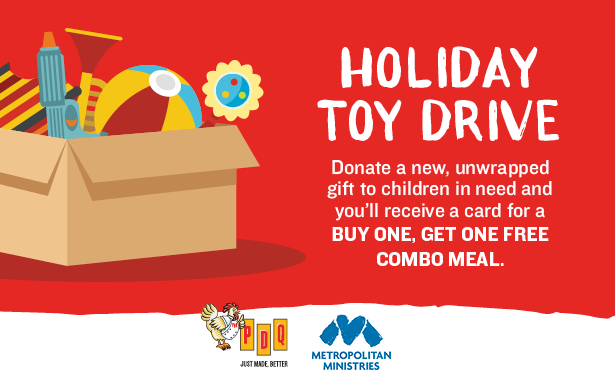 Stop in your local PDQ to donate a new, unwrapped toy. Each toy donated will go to a child in need in the Tampa Bay Area to unwrap this Christmas. All guests who make a donation will receive a PDQ bounceback card valid for a Free Combo Meal with the purchase of a Combo Meal. Check out the list below for each participating PDQ location and the dates in which the donation boxes will be collected.